On Friday 22nd & Saturday 23rd November, the Cultural Palace played host to a diverse group of artistic youth in Jordan, as they delivered an impressive and memorable show for the public. The fundraiser promoted the theme of peace via the performing arts, whilst providing an enjoyable night out for all. Beatboxing, rap, dance, music, and comedy sketches among other unmissable acts, entertained the audience throughout the evening! Well-known songs such as “Listen” and “Hallelujah” were definite crowd pleasers and had the audience singing along in unison. For the grande finale, the evening closed with a group performance of “We Are the World”. 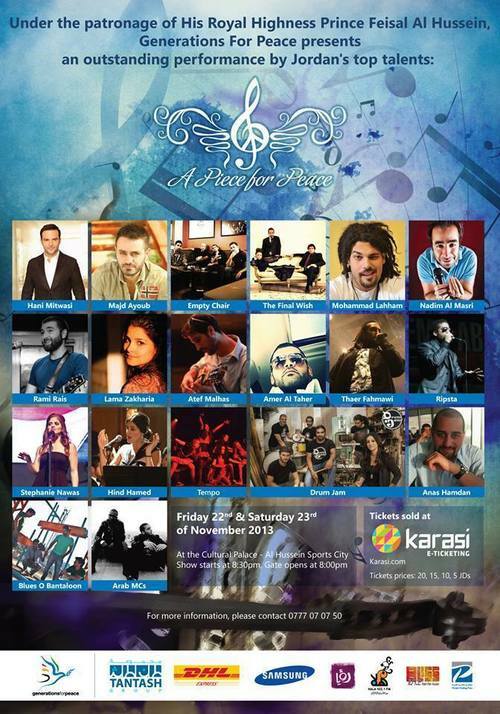 A Piece For Peace presented a rare opportunity for the youth in Jordan to showcase their talents and produce an unforgettable show! We would like to extend a huge thank you to everyone who supported the fundraiser!